Our Body Sugar Dusting Powders is simply amazing!!!!! We believe all GIRLS should use powder - Everyday! Not only does it help your clothes to slide on and off, which is really useful when you've just got out of the shower, but its wonderful on hot days....powder your parts and stay sweet and silky all day......not sweaty! We've been told our powder is also really useful when you want your clothes off in a hurry too! If you choose to add a little BLING....... and this fluffy powder will leave you twinkling, smelling sweet and feeling pretty. Tiny iridescent sparkles sprinkle all over your skin while the natural cornstarch absorbs moisture and leaves you feeling silky and smelling sweet. 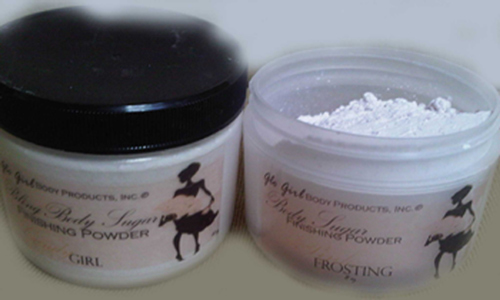 After you take a bath or shower, coat yourself in our Body Sugar Dusting Powder.